Designed to house electrical controls, instruments and components that require unrestricted viewing of the gauges or controls in areas which may be regularly hosed down or are in very wet or oily conditions. Provides protection from dust, dirt, oil, and water. ANSI-61 gray powder coat inside and out. Optional Subpanels are powder coated white. 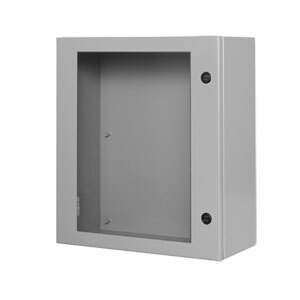 The enclosure and sub-panels can be custom ordered in 316 stainless steel.